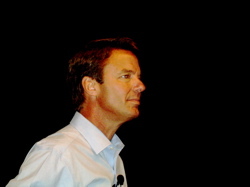 At the Gnomedex conference, being held in Seattle Washington, John Edwards led a spirited discussion of politics, citizen media and how the Internet is changing the political dialog. Though the audience was full of hundreds of people actively blogging, podcasting and video podcasting, he wasn’t afraid to be direct or to commit to a position. “There is a battle going on for the soul of the Democratic party,” said Edwards, suggesting that Democrats are battling over the idea of trying to appeal to the center versus trying to take the “right” position and showing genuine leadership.